Hi! I’m Bec, the founder and owner of Dragonfly Weddings & Events. For the past six years I’ve had the pleasure of introducing couples and their guests to the wonders of Port Douglas, sharing with them our spectacular venues, amazing food, attentive service and sumptuous atmosphere. I love the miniscule details of weddings, the thrill of ensuring every consideration has gone into ensuring your big day has been thoroughly planned for you and your loved ones to enjoy. It might sound a little lame but I love the rush of feeling organised, preparing lists, spreadsheets and budgets and working closely with suppliers to be certain that when you make that commitment to each other, you can be certain your ceremony and reception perfectly matches your style and the day goes off without a hitch! My background is in marketing and events management before I found my passion of organising weddings! In my role as Promotions & Marketing Manager for the NT Division of News Ltd I helped develop and oversee the inaugural NT Pride of Australia Medal awards in 2006 which I managed for the next two years before leaving Darwin. On my arrival to Port Douglas I was an events manager for Carnivale before spending four years as the Events & Marketing Manager at Port Douglas Catering & Events working on both weddings and business events. I also know what it’s like to get married in Port Douglas! This is where me and my husband Greg tied the knot under the palm trees on Four Mile Beach in 2010 and whilst we lived here, 90% of our guests travelled from interstate and New Zealand to share in our special day. 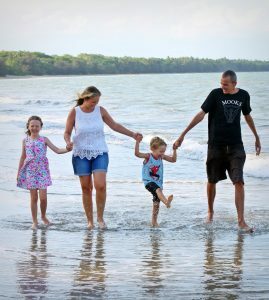 Our friends and family stayed and played in Port Douglas & the Daintree to fully embrace the magic of the region, which really added to the experience for us and them. 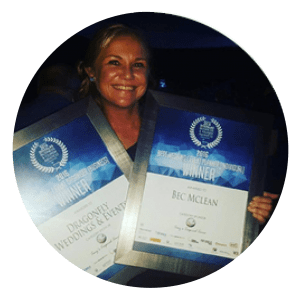 I was thrilled to receive the 2016 Port Douglas Business Awards – Best Wedding/Event Planner (Individual) as well as Best Wedding/Event Organiser (Business) on top of Best Wedding Organiser (Individual) in 2014. It is a wonderful feeling to be acknowledged for all the hard work and love that goes into each and every wedding. On top of this I am a proud mum to our two beautiful children Ava and Archie. As a family we love that we get to live in paradise and make the most of the many fun adventures to the beaches and creeks in our backyard. In 2017 we have also created our new family business Adventures Port Douglas so we can provide our wedding and events guests with the best touring options at the best prices available. This is my home and I’m very proud to showcase it. We’ve got so many talented, creative people in our community and I’d love to share our collective knowledge with you.